The Bible tells of two personages that carry the name John. 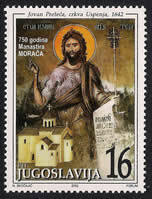 The first John is referred to as John the Baptist in the Western tradition and John the Forerunner in the Eastern Orthodox Church. To distinguish John from his namesake, John the Baptist, the former, a disciple of Jesus, is referred to as John the Evangelist in the West, John the Theologian in the orthodox tradition, and sometimes also called John the Divine, or John the Apostle. 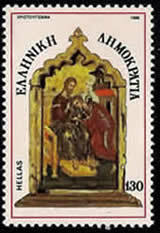 John the Forerunner is generally depicted based on the attributes accorded to him in the Gospels. He is presented with a strong-featured yet serene face, an intense look in his eyes, with long, flowing hair and a full beard. His appearance, facing forward, is as a hermit shrouded in rough sackcloth made of camel hair (Matthew 3,4). His hand gestures allude to his role as a preacher, offering a blessing (Fresco; 1642, Morača Monastery, Montenegro). In his left hand he is often portrayed clutching a rolled up scroll, a staff and sometimes a cross. 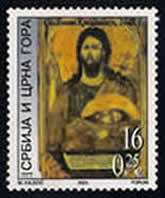 It is also common to see John the Forerunner carrying a silver platter displaying his head, in remembrance of his martyrdom (Icon, 1644, monastery in Metrovica (now in Orthodox Church in Belgrado, Serbia). Equally, the platter may display the naked Child Jesus, as a symbolic, prophetic reference to the coming of Christ, the Lamb of God. 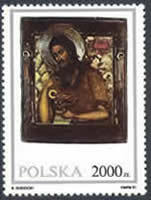 (Icon, Museum of Ziemia Lubuska, Poland). In Byzantine art, John the Baptist is also represented as an angel with wings. This characterization refers to the prophecy of Malachi as cited in the Gospel of Mark (1, 2): “Behold, I send my messenger before thee, who will prepare your way….” The Greek word for angel (†ἄγγελος,) carries a double meaning; as ‘messenger’ and ‘angel’ (Icon; 16th century, Albania); therefore John is both the heavenly messenger of the Lord and the precursor. 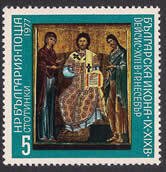 In the Eastern Orthodox Church, John is also given special importance, venerated in prayer and frequently depicted with the Mother of God: customarily they appear to the right and left of an enthroned Christ the King in the first row of icons. This composition, known as the deësis (prayer, intercession,supplication) has become a traditional element of the iconostasis (Icon; Deësis, 17th century, Bulgaria). John the Theologian was the youngest of the twelve apostles and it is said that he was the disciple most beloved by Jesus. This special relationship is illustrated in the iconography of the side panel from a 15th century icon of the Last Supper, whereby John tenderly leans into Jesus, his head on his master’s bosom (Benaki Museum, Athens). In icons, John the Theologian is variously depicted as a young, beardless disciple of Jesus and also as an old man with a flowing beard, symbolic of his exceptionally long life, the longest of any apostles. He is also the author of the eponymous Gospel and three Epistles in the New Testament. According to tradition, around AD 95, John was exiled by Emperor Domitian to the Greek island of Patmos. In the Cave of the Apocalypse he wrote The Book of Revelations also known as The Apocalypse. 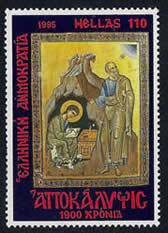 In the image on this stamp, an elderly John is portrayed at the entrance to his cave, dictating his vision of the end of the world to his scribe and pupil, Prochorus (Miniature from the year 1334, Library of the Monastery of Saint John the Theologian, Patmos). This article is dedicated to the former writer of this section, Hans Vonk, who died on January 15, 2015. His baptismal name was John.